All equipments are fixed on the pool body. If you are planning on moving home you won�t lose out on the investment you have made, unlike a traditional pool your Swimspa can go with you! • All the comforts of a spa. You get the massaging hot water jets and all the enjoyment that a spa can offer in a unit that also includes a swimming area. The only difference is that this is much more compact than a traditional in-ground pool with the addition of a separate area for a spa. • 'Traditional' pool benefits are included in a Swim Spa. • Compact design. 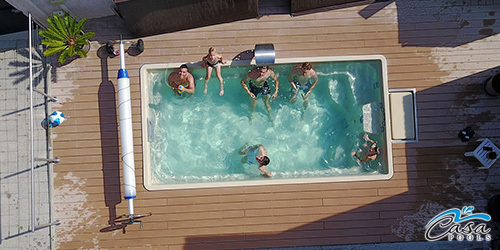 Swim spas don't take up nearly the amount of space as a traditional swimming pool. • Exercise. Perhaps the most popular reason to get a Swim Spa is to enjoy the ability to swim laps without worrying about turns or paying for a big pool. Water jets that can be adjusted for various speeds push out against the swimmer, keeping them in place, as they swim against the current. With the jets off, the Swim Spa can also be used for other water-based exercises. • Easier maintenance. Compared to a traditional swimming pool, the maintenance for a Swim Spa is much easier because it is smaller and uses fewer chemicals. • Convenience. Spas are great for relaxing and easing muscle tensions and aches, particularly after exercise. With the Swim Spa, you can go almost immediately from your water workout into the massaging waters of the spa. • Portable. Swim Spas that are not in-ground units have the advantage of being mobile, meaning they can move when you move. Or there's a certain benefit to adding to the price of your home because of the Swim Spa. • Use year-round. The Swim Spas are portable and they can be located indoors or outdoors. If you have an indoor location for a Swim Spa, you can enjoy the unit even on stormy or snowy days. • Encourage exercise. A Swim Spa that may have been meant for the swimmer in the family is likely to encourage others to try out the benefits of easy, lap swimming. The jets that provide resistance can be set for a beginner. The Spa area may appeal to the less active members of the family.